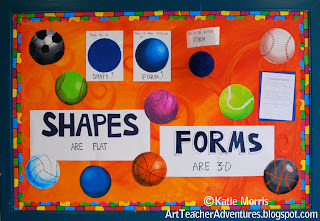 I've been trying to teach my students the difference between shapes and forms. 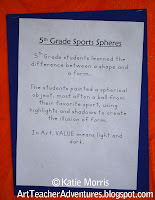 I knew I wanted to do a lesson with 5th grade focused on the illusion of form through creating value and when I found out that our Family Fun Night (an event that bring several hundred students and their families to the building) theme would be "Sportacular", I decided to use the spheres found in sports as inspiration. Really, it makes sense. Balls are something tangible that the students are very familiar with, and sports are very motivating. (*By the way, try not to say the word "balls" if you can avoid it. It often leads to wild giggles.) 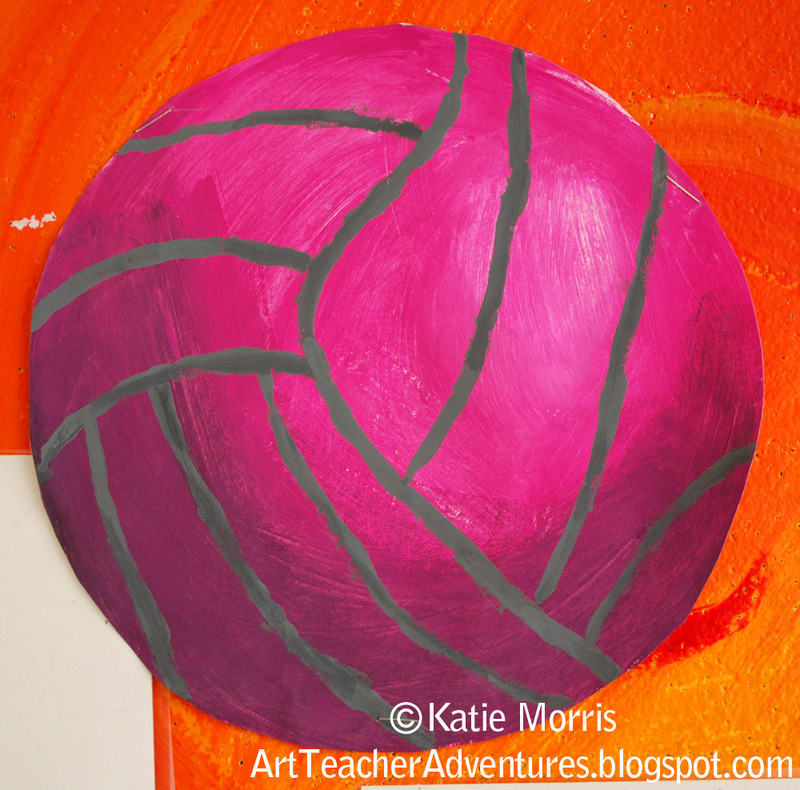 I did tell the students if they didn't want to paint a ball, they could think of another spherical object to paint. 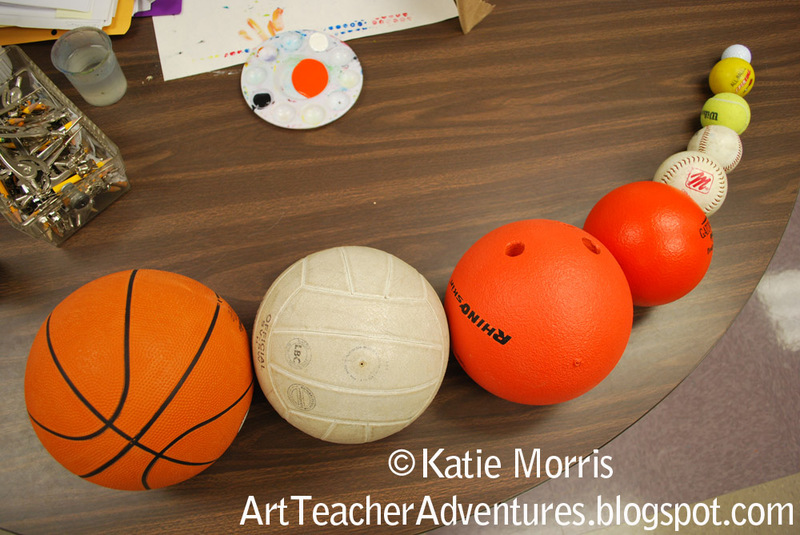 I borrowed a variety of balls from our PE teacher so the students would have a real object to look at. 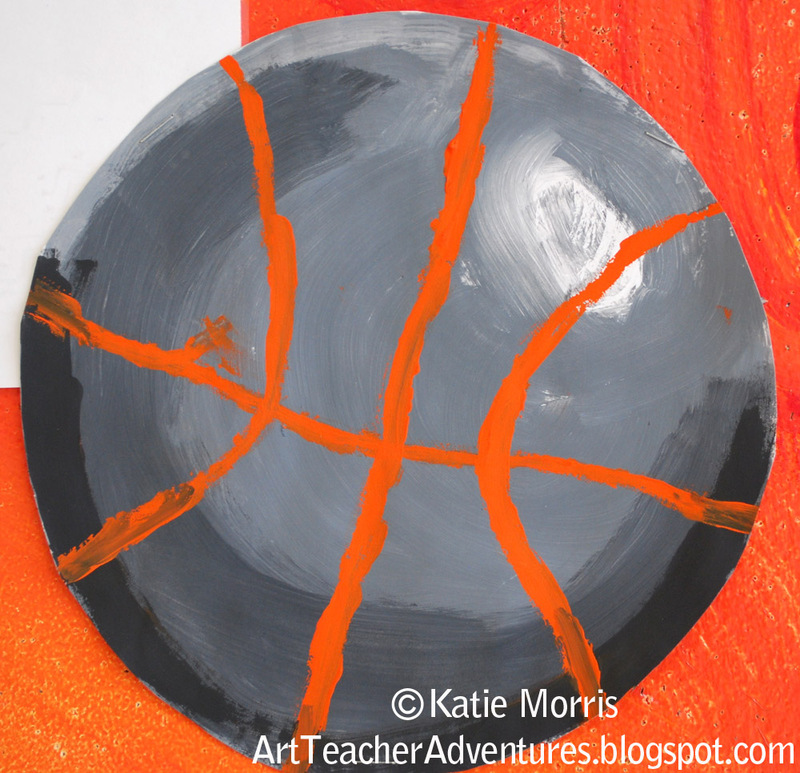 To introduce the assignment, I grabbed the real basketball, a painting I made of a basketball, and I made a quick line contour drawing of a basketball on the whiteboard. The students discussed how they were alike and different then I showed how 3D objects, objects with FORM, have highlights and shadows, and that adding highlights and shadows (VALUE) to paintings can create the illusion of form. I finally remembered to bring a flashlight to school which helped illustrate the concept of highlights. Regular fluorescent lighting is not directional so it can be hard for students to see. I demonstrated painting a sphere. I recommended that the students paint a base color first, followed by adding the highlight, then add the shadow last and blend, blend, blend. The students used a compass to draw a circle on a 9x12 inch piece of paper then chose their paint colors. 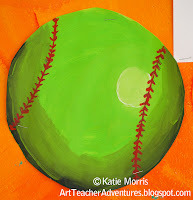 The balls did not have to be painted in traditional colors. For white spheres, I suggested choosing a color instead of black for the shadow. 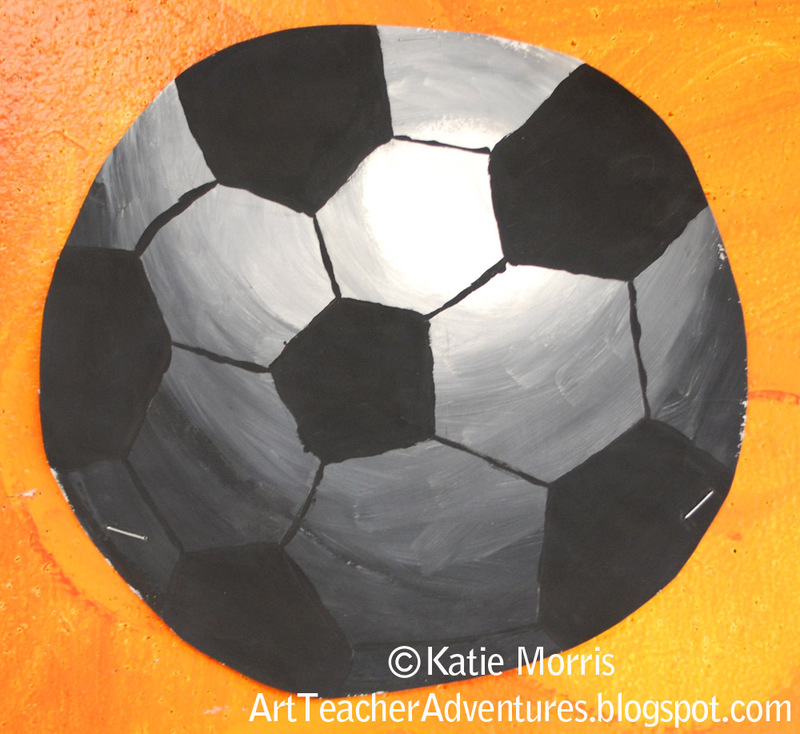 After the base of the sphere was painted, the students added the identifying lines. In the second class period, the students added the remaining details then cut out their balls. 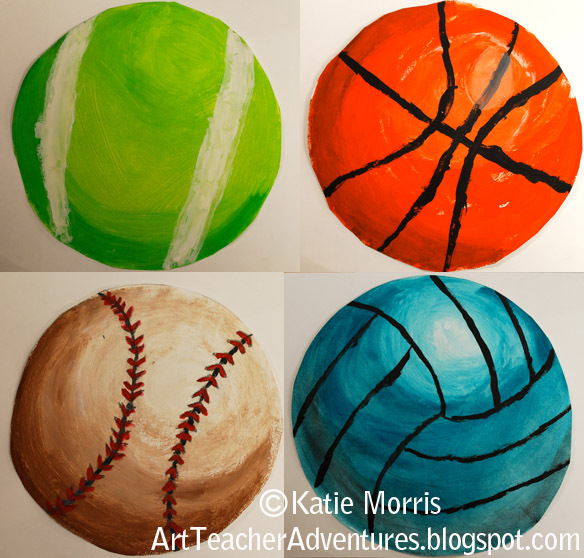 Because I knew I would be asked a hundred times how to draw the lines and I didn't have enough balls for everyone, I made up some reference pages that showed the steps for drawing a basketball, baseball/softball, volleyball, and how a tennis ball would look from different views. Only a few students attempted soccer balls and I showed them the "how to draw a soccer ball" page here because I honestly wasn't sure how the pentagons and hexagons fit together before. If I teach this same lesson again, I will not recommend golfballs. A couple students attempted, but there were too darn many dimples and it just didn't work out well. Most students drew in pencil first then used a thin brush to paint the lines and a few used sharpies. I hoped that all would have time to use the thin paintbrush because I thought it would be good to practice brush control. Some of the artwork went on my bulletin board and the rest of the balls were taped along the hallway walls to look like they were bouncing. After this project I found out that some of my 5th graders need more practice with their cutting skills! Or maybe it was an issue of patience. Either way, some students did a really nice job painting then cut it out so sloppily that it didn't even look like a circle anymore. I definitely wanted to use the bulletin board to drive home the main points with students and show everyone that we didn't just make decorations. My favorite part is below. 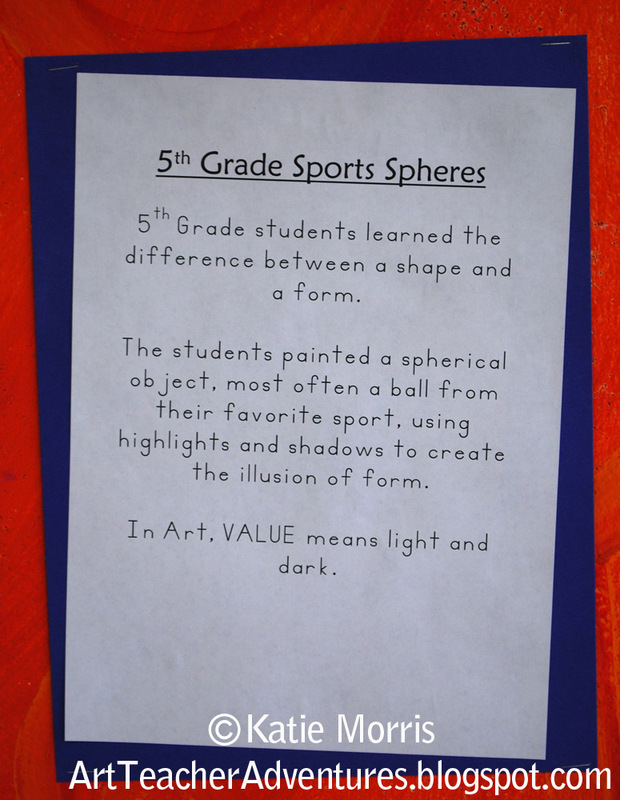 I labeled 2D examples with "this is a shape"and "this is the illusion of form" then painted a styrofoam ball the same color to hang from the ceiling with a label that says "this is an actual form". These look so great! I don't know why, but even at the high school level the kids always get shape and form confused. Glad you're using such a fun project to teach them- they'll definitely remember the difference now! but I don't post every day. I'll come back and check out your other posts... I think I'm going to enjoy reading your posts as the new school year is just around the corner. Thank you for an inspiring and sure to be popular lesson. I think this is one of my favorite skills to teach. Your kids did a terrific job!! What an incredible lesson plan for teaching tints and shades! Can't decide which ball I like the most. I would love to try this sometime...how about for Father's Day? Thanks for a fantastic post! 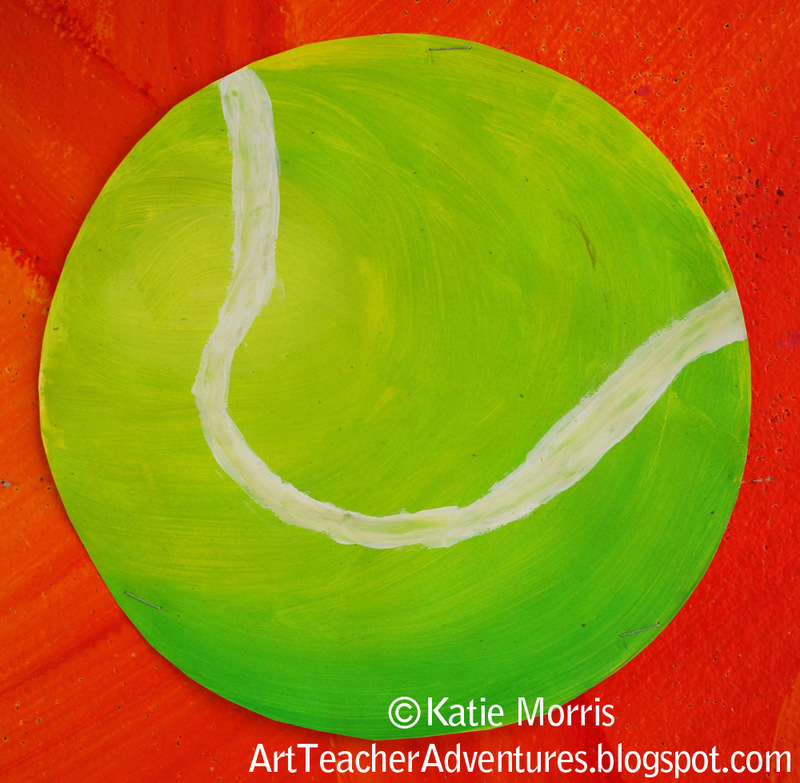 Found your site through Pinterest and can't wait to share it with my art teacher friends. Also see you are on Willowing, yay! What size did these end of being? 12x12? They were probably around 8x8. They started with 9x12 inch paper. Awesome job - these look great!!! I am thinking of doing this and displaying them in the gym at our school. Quick question: did you paint your bulletin board paper (background) or is that store bought?? It looks fantastic! I painted directly on the bulletin board because I hate covering them with paper! It saves a lot of time since I automatically have an interesting backgroUnd. I only cover it if I need a specific color. I'm about to do your project in a couple weeks! When you say "and blend, blend, blend" it's seems that the paint would still be wet so it COULD be blended. I assume you did not use tempera. Acrylic? Thanks for your direction! Actually we did use tempera! I haven't had enough money to order tempera and acrylic. Happy you're utilizing such a fun activity to show them-they'll unequivocally recall the distinction now!